Saw The Force Awakens last night with my youngest. He is 21 and I’m 55. We both loved it. Really cool in 3D. Since everyone expects Han to die sometime in this new trilogy, here’s how it needs to happen: There’s a bomb about to go off, and he can’t stop it or get away. Suddenly he notices a lead-lined refrigerator. He throws all the contents out on the floor and climbs in himself. It doesn’t do any good. I saw A New Hope at a drive in when I was six as well. I miss drive-ins. There are none around here anymore. I boggles my mind how Millenials can claim to have a “nostalgic feeling” about a movie that was on the big screens 22 years before they even existed. 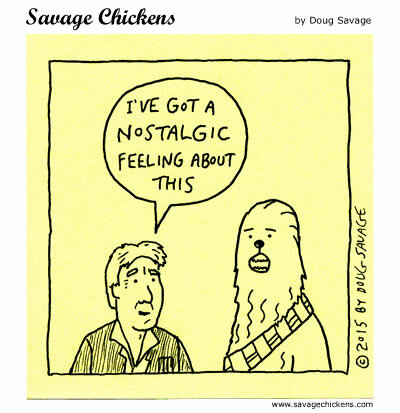 That would be like me claiming to have a nostalgic feeling about The Longest Day, or The Maltese Falcon. It’s ridiculous.